Mutsy is unable to supply accessories and spare parts directly to consumers. For spare parts and accessories please visit the Mutsy sales outlets. In the event of more complex questions, the store owner will contact Mutsy. 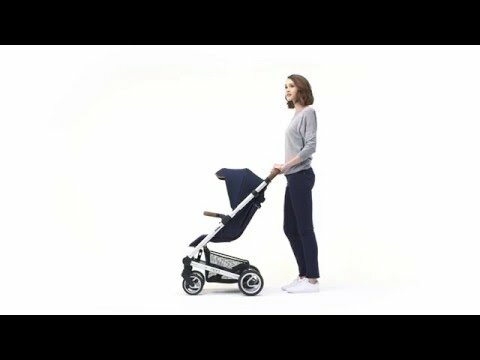 How old must my child be in order to use the NEXO? How much weight can it carry? The pushchair seat is suitable for children from 0 months and upwards up to 15 kg. Infants younger than 6 months must be strolled in a flat fully reclined position. To do so, you must set the pram seat in the baby position. This position makes the reclining angle flat and ensures more comfort and safety. The pram seat must be removed from the baby position for infants from 6 months and up to 15 kg. How to fold and unfold my Mutsy NEXO? Keep children away from all moving parts when unfolding. Press the unfolding safeguard inwards and lift the upper frame up until the lower support clicks into place. Move the push-bar backwards until you hear a second click. Before use always check that the pram has been unfolded and secured correctly. Stand behind the frame and put the frame on the brake. Put the height adjustment buttons of the push bar in the lowest position. Pull the release buttons of the upper frame towards you on both sides and turn the push bar forwards until the push bar is on the lower support. Pinch the lower frame unlocking buttons and fold the frame. The folding safeguard locks automatically when the product is folded up. You can carry the frame from the push bar when the folding safeguard has been locked. The button for adjusting the back support is located at the rear of the back support. Pinch the button and continue pressing it while moving the back support backwards to lower the back support. Release the button when the back support has reached the desired position. Pinch the button and continue pressing it while moving the back support forwards to bring the back support in an upright position. Release the button when the back support has reached the desired position. How do I replace the seat cover? It is not possible to replace the seat upholstery. The Evo basket at the base of the frame can carry a weight of 5kg. How do I adjust the 5 point safety harness? In order to adapt the length of the shoulder belts, you release the shoulder protection from the belt by pulling the Velcro loose. The straps of the belt are now free in order to adapt the length. You adapt the length by sliding the straps over the shoulder belts until both shoulder belts properly harness your child. Slide the strap down to make the belt longer. Move the strap upwards to make the belt shorter. This will create a loop in the belt. Hold on to the strap and pull the clamps to take the loop out of the belt again. Attach the shoulder protection to the belt again on both sides after adjustment by pressing the velcro together again. The back support contains three positions for the shoulder belts. Release both shoulder belts by inserting the fastening rings at the rear of the back support through the openings. Look for the fastening ring through the fabric. Tilt it and push it through the opening. Move the attachment rings through the desired openings so that the shoulder belts are positioned properly. In order to adjust the position of the leg piece, open the upholstery under the seat by pulling the velcro loose. The fastening ring of the leg piece is located at the bottom of the seat between the seat and the elastic. You can tilt the fastening ring with your hand and push it through the opening to adjust it. Regularly check the length and position of the belts and adjust, where necessary. Assemble the rear wheels: Slide the axle of the rear wheel in the rear wheel casing until you hear a click. Pull the wheel to check that it has been attached firmly. Assemble the front wheels: Slide the axle of the front wheel upwards in the front wheel casing until you hear a click. Pull the wheel to check that it has been attached firmly. Disassemble the front wheels: Push the button on the back side of the front wheel and pull the wheel from the front wheel casing. How can I make the wheels swivel or stop them from swivelling? Turn the ring above the front wheel outwards on both sides in order to block the swivel setting. The swivelling wheels will automatically be locked when the wheels are placed in the rear direction. Turn the ring above the front wheel on both sides inwards to unlock the swivelling wheels. Removable fabric parts can be washed in the washing machine on a wool cycle at 30°C. Wash without bleaching agent and do not put in the tumble dryer. Do not iron or dry clean. Before washing fasten all zips, velcro and poppers. You can treat stains on the outer fabric or lining of non-removable parts using a liquid, bleach-free soap. Always treat the whole area. How do I secure the Nexo footmuff? The adapter marked with ‘R’ is placed on the right side of the frame, the adapter e adapter marked ‘L’ is placed on the left side. Remove the bumper bar and the hood. There is an opening at the front of the adapter. Put the opening of the adapter around the cam on the frame from the outside. Turn the top of the adapter inwards until it clicks. Check that the adapter has been attached properly by trying to lift it from the frame. 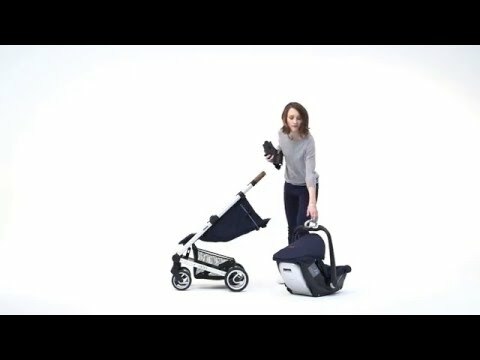 Which car seats are compatible with the Mutsy NEXO?